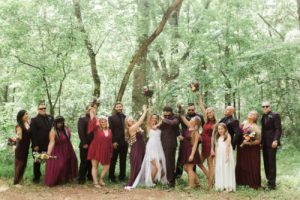 2018 Wedding Trends right here @ The Music Camp!! According to the Vogue.com post below, The Music Camp is ahead of the game when it comes to decor! Trees! And greenery! We’ve got lots of that! In the forrest & along the river. After party? That’s what we do! The Music Camp encourages after parties. We have created Glamping & Camping packages and Center Camp, so you and your guest don’t have to leave. For a small additional charge you and your guest can camp out overnight along the river. What’s more fun then ending a busy wedding day then with good folks sitting around a campfire sharing stories of the day and for some, uniting with new family members. “Trees! We’re seeing a huge interest in trees of all kinds—from olive to citrus, cypress to birch. I love the impact of their scale in a space, and whether rented or purchased and planted in the ground after the wedding, trees are a wonderful antidote to disposable wedding décor. This a beginning that always needed a location . Thank goodness we have one ! If it is a wedding or a music event …. never go it alone. Hire a pro team so you and yours can enjoy the whole evening (you only get one shot at this). Small or large, summer or winter, these folks can bring your dream to fruition with atmosphere, attention to detail and all steps are completed till the last guest has left safely for home. Rarely is a country setting with character accompanied by a staff of devoted pros. Call and completely enjoy your dream made real and real FUN! I have known these folks for a long while and from ocean to mountains, they set the standard of event experience. Start smart and enjoy your day. I always have.